Worldwide, approximately 41,250 species of spiders have been identified, with approximately 3,400 species that call North America home. In the U. S. the Black Widow spider is the most venomous, while the Brown Recluse claims the largest number of bites in the U. S. The presence of either of these dangerous animals in the home should be met with pest control in Fort Worth. Routine treatment may be necessary, as they tend to restore populations in their former dwelling even after treatment. This is most likely due to the home providing a favorable environment for them. Talking to your pest control expert can provide you with tips to make the home less attractive to spiders. The prolific spider can rapidly infest a home. If you suspect an infestation and suspect the species are the Black Widow or Brown Recluse, call for pest control in Fort Worth. Prevention is the best means of spider control. Making the home less attractive to spiders and providing routine pest control in Fort Worth will be the most effective means of preventing spiders. Black Widow spiders are the most poisonous spider in the U.S. Adult Black widow spiders are recognized for the red hourglass shape under their abdomen. Its name comes from the popular belief that the female black widow spider eats the male after mating, this actually occurs rarely. On the other hand, juvenile Black Widow spiders display a pattern of tan and white stripes. As the spider grows and molts, females will display increasing amounts of black coloring in the integument with each molt, whereas males will retain the juvenile pattern of tan and white stripes. The Black Widow can lay up to nine egg sacks during the summer, and each sac may contain up to 400 eggs that will hatch in two weeks. The egg sacs are white, fading to brown as it dries out. Despite its prolific breeding, the Black Widow doesn’t claim the most bites among humans. This title goes to the Brown Recluse. Give us a call for pest control in Fort Worth. A bite from a female black widow spider soon results in slight swelling and faint red marks, then within a few hours’ severe pain and stiffness set in. Other symptoms related to the bite include chills, fever, weakness, headache, elevated blood pressure, nausea, vomiting, and severe abdominal pain. Young children, the elderly and those with high blood pressure are at greatest risk. Medical attention should be sought for the symptoms if you are bitten. A black widow spider antivenin is available, but is rarely necessary. If you are seeing Black Widow spiders in your home, you may have an infestation. Don’t risk it with the potentially deadly Black Widow Spider. 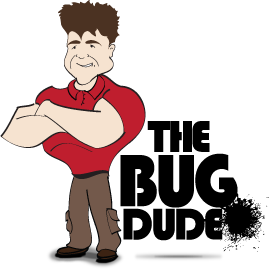 Give The Bug Dude a call for prompt pest control in Fort Worth. The characteristic trait of the Brown recluse spider is a dark brown violin marking on their back. These spiders spin irregular webs, which are used as a retreat. They prefer to build their web in dry locations that are generally undisturbed, such as closets, in stacked or piled clothes, in gloves, in dressers and sleeping sofas, and in the bedsheets of seldom used beds to name a few. The Brown Recluse bears potentially deadly hemotoxic venom. Infection due to necrotic tissue is common and requires immediate medical treatment. If you routinely see these spiders in your home, you may have an infestation, give The Bug Dude a call for prompt pest control in Fort Worth. Let us eradicate these potentially deadly spiders from your home. The Brown recluse lays her off white egg sac May through August. Each egg sac contains 40 to 80 eggs, which hatch in 24 to 36 days. Up to 3 eggs sacs may be laid a year. The bite of a brown recluse will include some pain or burning within the first 10 minutes of the bite, along with itching. Some of those bitten complained of a temporary pain with slight burning that last only a second or two, followed by intense itching. The bite assumes a bull’s-eye appearance with a blister in the center. When the blister breaks it leaves an ulcer that scabs over. The ulcer can spread and attack the underlying skin and muscle, causing severe pain, fever, chills, nausea, vomiting, muscle aches, and anemia, and gangrene. Bite victims should seek medical attention, especially if the wound does not heal or symptoms of infection are present. The area of the bite can become a deep red, swollen with pain present. The affected area can become quite large. As the tissue surrounding the bite necrosis, the wound area will take on a purple cast in some areas and may or may not be draining. If the victim has not already seen a physician at the point of the wound swelling and turning red, the victim must immediately seek medical attention as the infection can quickly overwhelm the body. Brown Recluse bites can result in death due to infection and gangrene. They have been known to invade homes and present the threat of infestation. They are not aggressive, and will bite only when threatened or mashed (usually accidentally as in putting on shoes where the spider resides). However, due to the risks they pose, if you see these spiders often you may have an infestation populating and breeding in the walls or under your home. Don’t risk it, seek pest control in Fort Worth for spider control. Spider control can be a serious concern for homeowners. Of the approximate 3,400 species of spiders throughout North America, only two in the southern and western United States are potentially deadly – the black widow and brown recluse. They can rapidly become an infestation, especially with the Brown Recluse, and require pest control in Fort Worth. If spiders are infesting your home, give us a call. We will inspect your home, identify the species of spider and provide the appropriate pest control in Fort Worth for spider control. Thanks, for visiting the The Bug Dude.